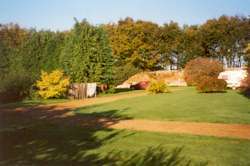 We are a small family run site in a walled garden which is sheltered by a belt of large beech trees. We only have 30 pitches which cover the site in four different areas. We don't have a shop but are close to Docking, where there is all one needs. There are also lovely dog walks around the woods outside the site (max 2 dogs per pitch). The small office is not always attended, so guests are asked to pitch where they like and we will be around later. Click here to see a map and directions. Please bring your own TV cable - thank you! Golf courses at Brancaster, Fakenham, Heacham and Hunstanton. Click to see some reviews. "...secluded oasis run in an informal manner, in a good location for exploring North Norfolk." 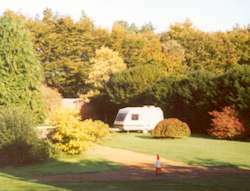 Site content Copyright 2001-2019 The Garden Caravan Site. All rights reserved.